I used the Brushed paper pack for one set of cards and the Pathfinding paper pack for the other. 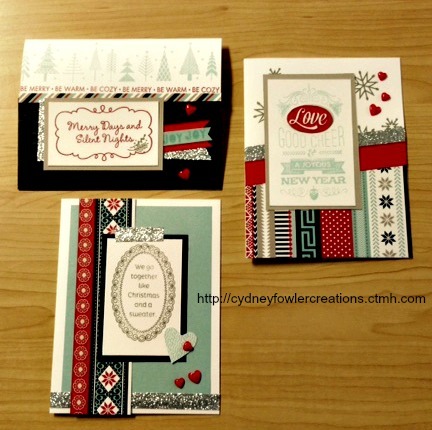 These are both current Close to my Heart paper packs found in the Annual Inspirations Idea Book and Catalog. 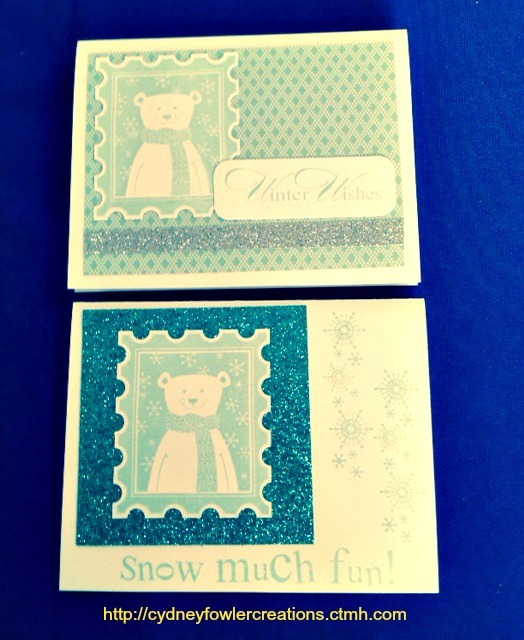 Any of the beautifully coordinated CTMH paper packs work well for these cards. 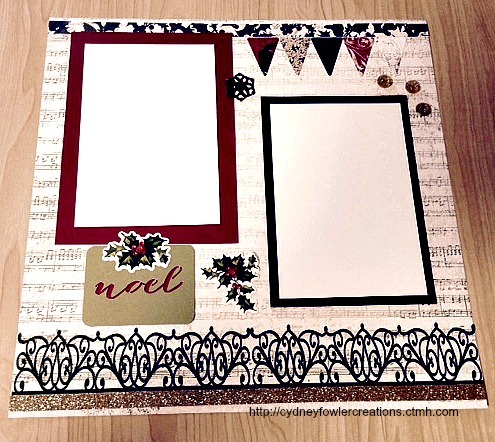 I find the link to this one sheet wonder template and tutorial on Pinterest. It is by Jessica and can be found at http://inkitupwithjessica.com/one-sheet-wonder-tutorial. There are many one sheet wonder templates to choose from on Pinterest. This one caught my eye and I found it easy to follow and use. I like the way the cards come out. You only use one sheet of B&T duos patterned paper and four sheets of coordinating solid papers (two of each of two colors) plus one sheet of white for the sayings and images to be stamped on. 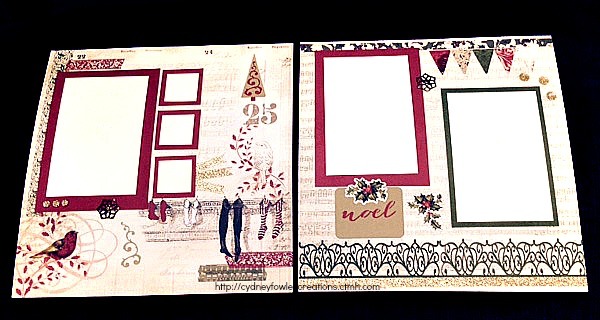 The template illustrates what sizes to cut the patterned paper and which cards they go with (A, B, C, D and E). 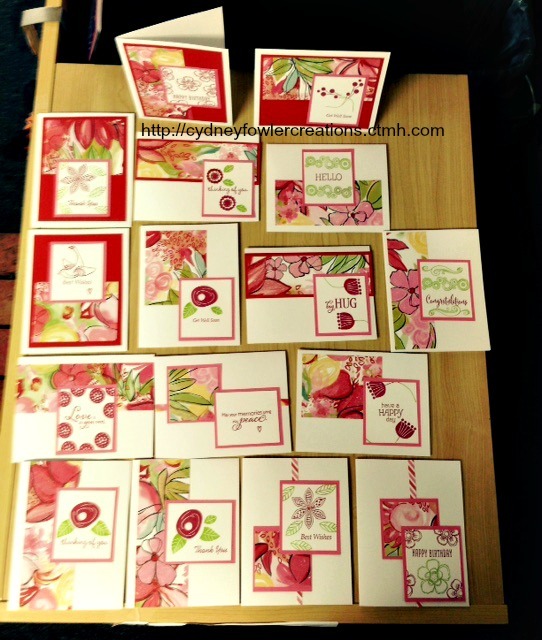 The tutorial explains how to cut the other pieces easily and how to put all of the cards together. You need sixteen card bases. I used the CTMH bulk card bases or you can make your own out of 8 1/2 by 11 inch paper. Cut the 11 inch side of the paper into two 5 1/2 inch pieces and fold each of those in half to get two card bases per sheet of paper. 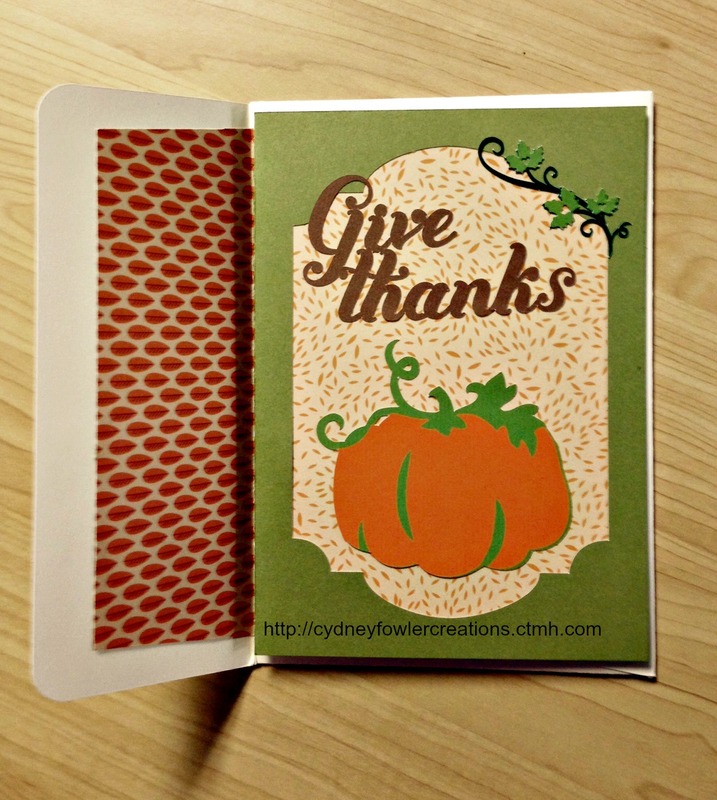 If you don’t have 8 1/2 by 11 paper, trim the 12 x 12 down – be sure to save the scraps for other uses like stamping phrases on for other cards or layouts. 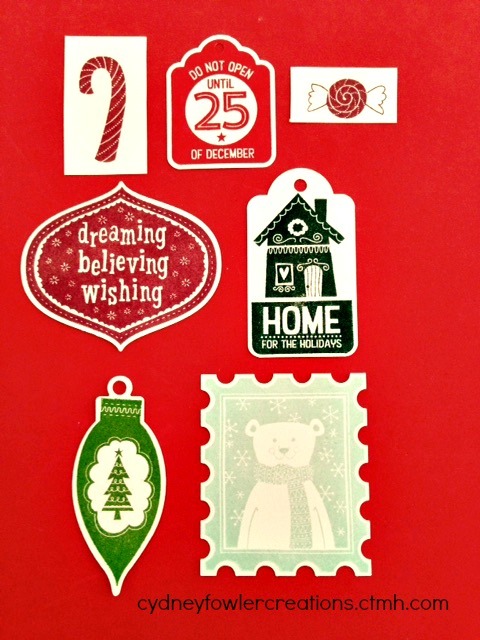 I used a variety of stamps from my collection for the card sayings. 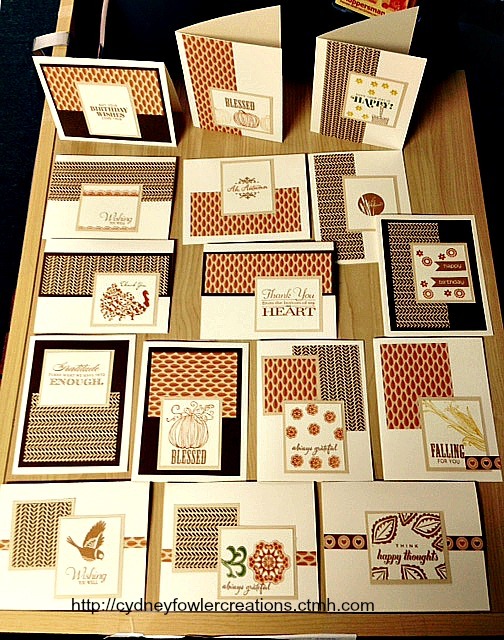 I enjoyed making these coordinated all occasion cards and will move on to some holiday cards next. I also discovered a one sheet wonder set up in the Close to my Heart “Wishes” card confidence book and want to try that one too. It looks similarly easy to put together 16 cards (two each of 8 designs). The instructions and photos begin on page 110 of the Wishes book (Close to my Heart Item # 9041). Stamp sets of your choice applicable to the occasions you want your cards for; smaller size stamps work best as the white pieces are small rectangles. If you wish to purchase Close to my Heart supplies for this project, visit my online shop at http://cydneyfowlercreations.ctmh.com and Happy Crafting! 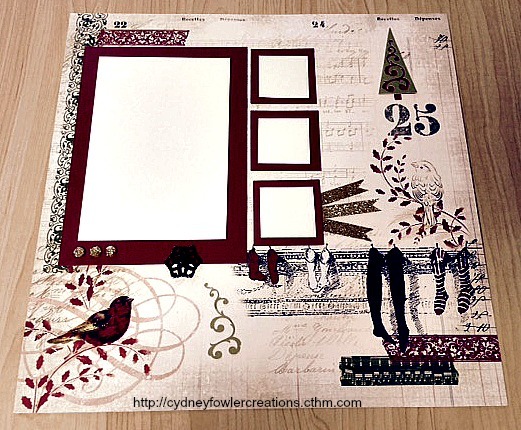 Welcome to our September Damask Divas blog hop featuring the Close to my Heart paper pack, Scaredy Cat. Halloween will be here before we know it! If you came here from Lilian’s blog, then you are in the right place. You can always click here to go to the Damask Divas blog page and view all that it has to offer including a complete list of blog hop participants. I could not resist creating a Halloween themed wreath with these papers. Of course, the color palette does not limit you to Halloween since most of the pack are bright patterns you can use for other themes. I really liked the actual Halloween themed page in the pack and I fussy cut some of the cute designs and sayings from it to include on my wreath. I love rosettes so I decided to make the wreath with a variety of rosettes in different sizes using each of the patterned papers in the pack. I also used the metal pieces from the Scaredy Cat assortment to add interesting accents and was able to bend them a little to fit the round of the wreath base. They are a little hard to see in the photo, but they are tucked between the rosettes and one is on the front of the bottom rosette. I wrapped the wreath base in burlap ribbon and orange organza ribbon. The bow is black tulle. I think it is a fun little project. I cut the rosette strips by hand, but you can also cut them from the CTMH Artiste Cricut cartridge and have fun details on the edges. I scored them using my scoreboard and used liquid glass to glue them together. You glue the accordion pleated end to end to make a circle. 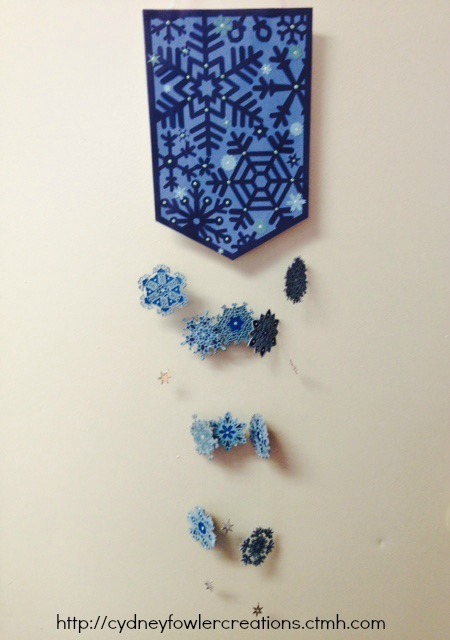 The smaller rosettes are a strip of paper 1 1/4″ by 12″ scored at 1/4″ intervals to make a 2.5″ round rosette. The middle size is two strips of 2″ by 12″, scored at 1/2″ intervals and glue the two together to make a 4″ round rosette. The largest is 2 1/2″ by 12″ scored at 1/2″ intervals – also two strips glued together for a 5″ round rosette. You will need one inch paper circles (two for each rosette) to hold them together. You can then add an embellishment over the circle as I did or leave them showing if you use coordinating paper for the circles. The trick is to have your accordion pleated circle sitting on your work table and push the middle together while pulling the outside edges out. Have your circles ready with the glue on them. Push the circle as tight into the middle as you would like and press a circle on until the glue is holding, then flip it over and glue the circle on the other side. I used hot glue to glue them to the wreath, but liquid glass would work too. You will also need a wreath base, ribbons to wrap the base, unless you use a grapevine wreath, and wide ribbon or tulle for a bow. Visit my online shop at http://cydneyfowlercreations.ctmh.com to purchase CTMH items or contact your own Close to my Heart Independent Consultant. Don’t forget to check out the CTMH Stamp of the Month program and special purchase offers each month. I hope this project inspires you! The next stop on the blog hop is Melissa’s. Click here to see her project! Enjoy and Happy Crafting!